Yves Klein (28 April 1928 – 6 June 1962) was a French artist. 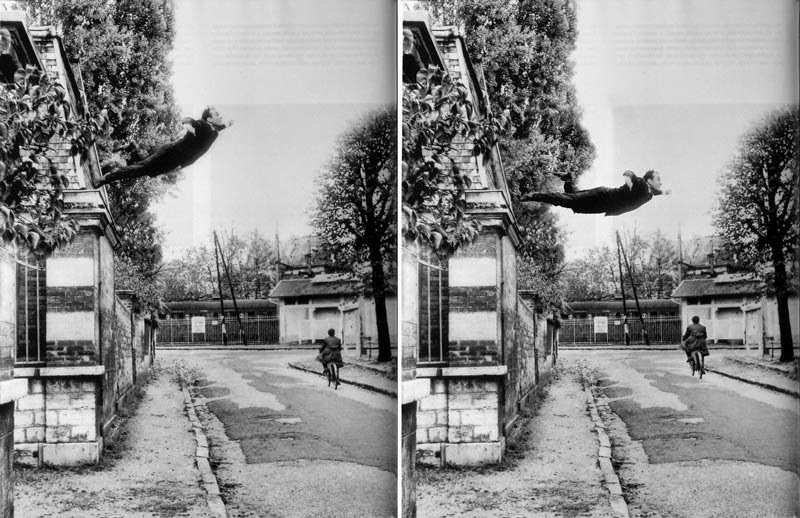 Saut dans le vide (Leap into the Void), originally published in the artist's book Dimanche, which apparently shows him jumping off a wall, arms outstretched, towards the pavement. Klein used the photograph as evidence of his ability to undertake unaided lunar travel. 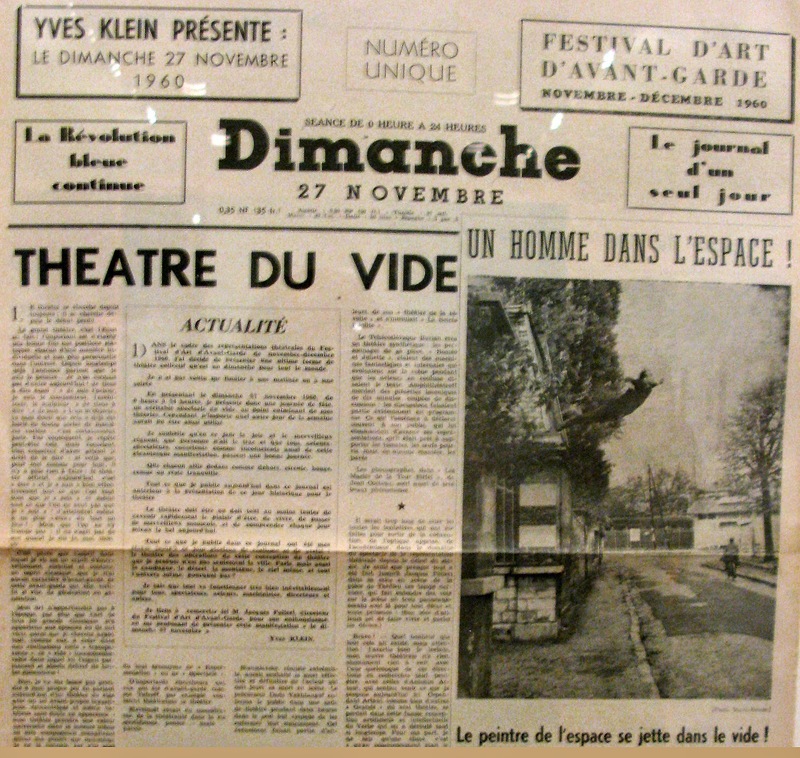 In fact, "Saut dans le vide", published as part of a broadside on the part of Klein (the "artist of space") denouncing NASA's own lunar expeditions as hubris and folly, was a photomontage in which the large tarpaulin Klein leaped onto was removed from the final image. Klein's work revolved around a Zen-influenced concept he came to describe as "le Vide" (the Void). Klein's Void is a nirvana-like state that is void of worldly influences; a neutral zone where one is inspired to pay attention to ones own sensibilities, and to "reality" as opposed to "representation". Klein presented his work in forms that were recognized as art—paintings, a book, a musical composition—but then would take away the expected content of that form (paintings without pictures, a book without words, a musical composition without in fact composition) leaving only a shell, as it were. In this way he tried to create for the audience his "Zones of Immaterial Pictorial Sensibility". Instead of representing objects in a subjective, artistic way, Klein wanted his subjects to be represented by their imprint: the image of their absence. Klein's work strongly refers to a theoretical/arthistorical context as well as to philosophy/metaphysics and with his work he aimed to combine these. He tried to make his audience experience a state where an idea could simultaneously be "felt" as well as "understood".